This is a design for armour for William Compton (1568-1630), 2nd Baron Compton and first Earl of Northampton, and comes from an album of designs known as the Almain Armourer's Album, or Jacob Album. The Album is one of the Victoria and Albert Museum's great Elizabethan treasures. It was compiled between 1557 and 1587 by Master Armourer, Jacob Halder, and records, in vivid detail, notable commissions at the English Royal Armoury in Greenwich during those years. This design shows a light cavalry armour for battle with supplementary pieces for jousting. The supplementary pieces include a reinforcing breastplate, saddle steels and stirrups. The design is painted reddish brown to denote that the armour should be heat-treated to a deep blue and deecorated with vertical bands of blackened and gilded etching resembling the embroidery on contemporary doublets. The designs in the album are stencilled, inked and painted with watercolour. This design is annotated 'My Lorde Cumpton'. William Compton, 2nd Baron Compton and first Earl of Northampton, was a renowned jouster and avid participant at the Accession Day tilts. A portrait miniature in the English Royal Collection depicts Compton in this armour, showing its original colour of deep blue and bright gilding. 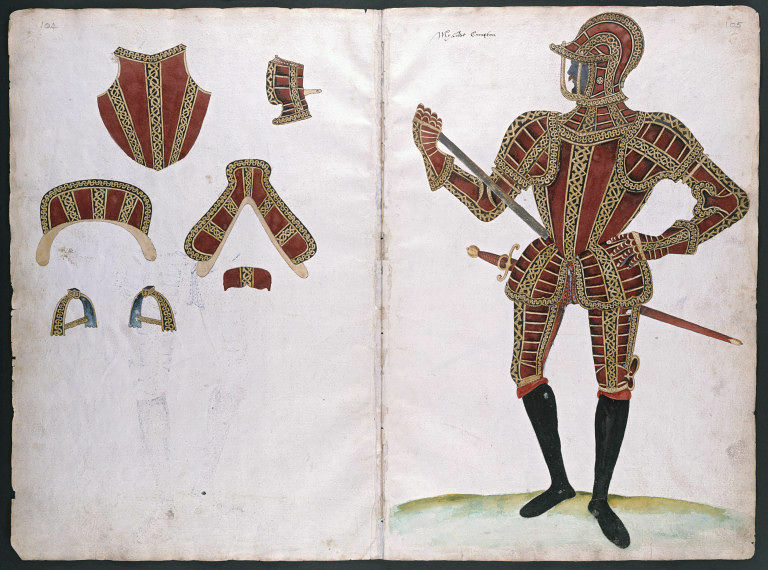 Double-page design for armour for William Compton (1568-1630), 2nd Baron Compton and first Earl of Northampton, showing a light cavalry armour for battle with supplementary pieces for jousting. The main figure is on the right hand page and stands on a green surface signifying grass, and faces left. The supplementary pieces are on the left hand page. The supplementary pieces include a reinforcing breastplate, saddle steels and stirrups. The design is painted reddish brown to denote that the armour should be heat-treated to a deep blue and deecorated with vertical bands of blackened and gilded etching resembling the embroidery on contemporary doublets. The design is stencilled, inked and painted with watercolour, and is annotated 'My Lorde Cumpton'. 'My Lorde Cumpton'. Double-page design from the Almain Armourers' Album, Royal Armouries, Greenwich, compiled between 1557 and 1587, showing a design for an armour and supplementary pieces for William Compton, 2nd Baron Compton (1568-1630) (page nos. 104-105). 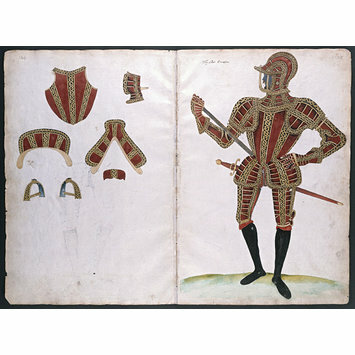 Note: the main armour design showing the standing figure is on the right hand page of the double-page spread.